One problem though... I don't cook. In honor of pioneer day, I decided to give it a try. I already had some yeast start Caleb had given me. He gives the stuff away to anyone that emails him. I had his recipe. I had a picture of the end result. I've even taken a bite of one of his waffles, the same thing basically. We had the exact same ingredients and preparation, but mine ended up looking something like hockey pucks. The taste wasn't a whole lot better. I had all the basic elements correct, but somehow I missed in the execution. The same thing can happen in writing. We can have the best concept, lovable and engaging characters and a plot to die for. But if there's something amiss in the execution, the story can leave a bad taste in our mouths. So should you toss the story and your whole writing career in the trash along with my burnt pancakes? Both the natural yeast and the writing have big pay offs and are worth the work to hammer out the kinks. Though this particular batch of pancakes wasn't salvageable, your story might still be. Let those solid characters sit for a while and let yourself get some distance and grow as a writer before you tackle it again. If your story recipe is good, it's worth it to try cooking it up again. If we can learn anything from the pioneers it's that the journey can be tough and push us to our limits, but the end is worth the work, blood, sweat, and tears. Where would a lot of us be if the pioneers had decided it was easier to stay home? Thanks for reading everyone and keep writing. 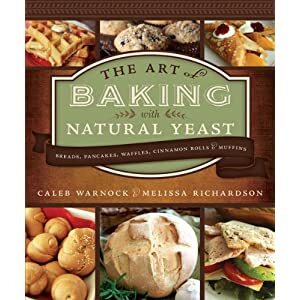 If you are interested in learning more about natural yeast, you can hop over to Caleb's blog. If you want more from me, you can visit this week's posts Heaven's to Betsy! Game of Life and the Definition of Failure.